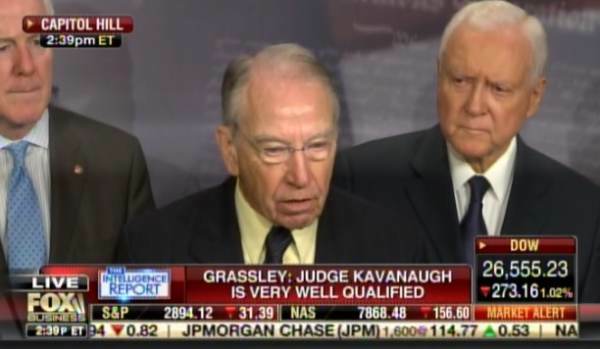 GOP Majority Leader Mitch McConnell along with Republican Judiciary Chairman Chuck Grassley and several Republican senators held a press conference this afternoon on Capitol Hill. Chuck Grassley immediately began attacking Minority Leader Chuck Schumer for his dirty attacks on Judge Brett Kavanaugh and his delay tactics against the SCOTUS nominee. Senator Orrin Hatch apologized to Brett Kavanaugh for the disgusting way he has been treated by Democrat senators. GOP Senator John Cornyn said a vote against Judge Kavanaugh would be an endorsement of the rotten tactics Democrats used to smear the Republican nominee. Cornyn said now was the time to quit the antics.